My guy and I moved from Mississauga to Brisbane back in April 2012. Our plan was to live in Brisbane for two years then head back to the Great White North where we’d again face the realities of family and non-family commitments, four distinct seasons and possibly a polar vortex. Living in a tropical climate has its perks for sure. Brisbane’s population just surpassed 1.8 million making it the third largest city in Australia. Not as many as Toronto’s 2.7 million, but they’re getting there. Despite the third from the top ranking, there’s still a sense of small town living that you don’t experience in Australia’s largest cities, Sydney and Melbourne, and which you certainly don’t experience in Toronto. Is it the noticeable lack of commuter traffic, really quiet neighbourhoods and plenty of sandy, beautiful beaches that lends to this sense of space? For those of you contemplating a move to Brisbane, here’s the nitty-gritty from an insider ex pat. The weather in Brisbane is simply amazing. Countless days of nothing but blue skies. Seriously. Not even the white fluffy kind in the distance. Same with the beaches. They’re breathtaking. There are so many beaches that there’s no need to cram everyone onto one so there’s always space to spread out and get comfy. 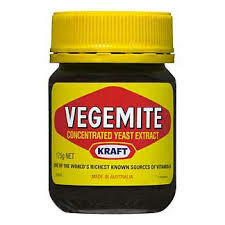 There’s nothing quite like the taste of Vegemite. Really. Having never tried it before coming to Australia, we heard a lot about it and made sure it was one of the first items on our grocery list. I like it. I like it a lot. It’s salty, savoury, and yeasty. My guy describes it as “super concentrated, salty pan drippings”. That’s a pretty good description. It’s actually quite healthy as it’s made up of all the B vitamins. All in a salty flavour bomb. Kangaroo is delicious. It’s lean, flavourful and best served medium-rare. That’s all I’m going to say. I don’t drink coffee, but I hear a flat white is the best coffee. Ever. If you want to order one in North America, it’s a ‘no-foam cappuccino’. It’s from Australia/New Zealand. Many Aussies who visit North America are heart-broken (and sometimes fuming) when they can’t get a decent flat white abroad. Despite being geographically located near many Asian countries, Brisbane’s cultural diversity is nothing like Toronto’s. This is probably one of the things that disappoints me most about being here. We were so privileged to have lived in one of the most multi-cultural cities in the world. We saw a diverse view of different cultures and had access to any and all type of cuisine. Brisbane is just starting to embrace the different cultures which reside within but it’s a long road to get to where Toronto is. Melbourne and Sydney are up there with decades of immigration from all over the world contributing to its diversity in food, landscape, and architecture. It took ages to find a Vietnamese restaurant who could make a decent phở and it’s still not as good as the one we get back in Toronto. They have Mexican and Italian restaurants here, but they’re more “Mexican’ish” or “Italian’ish”. I think the issue is that they’re catering to the Brisbane palate, where their idea of cheesecake is cream cheese and sugar spread onto a pre-baked cookie base. I’m sorry but that’s not a cheesecake. That’s what I throw together when I’m craving something fast and sweet to eat and don’t mind being ghetto. Same with hot dogs or sausages. They deserve the respect of a proper sausage/hot dog bun, not a slice of white bread. Television and movies are far behind that there’s no wonder people download movies illegally. If you want to watch shows as they air on regular cable in North America, you have to pay for premium cable or wait weeks, months sometimes even years before you can watch it. Australia just aired the first season of their version of The Bachelor. Welcome to 2002!!! The movie 12 Years a Slave is only just being released this week. Chauvinism is alive and well here. And it’s accepted. That’s right, not just tolerated, but accepted. I once had a supervisor tell me that the next person they hired in the department would have to be male because the group they would be working with didn’t want to work with a female. The supervisor was male. Is that even legal? I put it forward to HR but nothing came of it. A male was hired for the role, just in case you were wondering. Is this due to the small town mentality where men run businesses and women get together with other women only for coffee catch ups and brunch all while wearing pricey yoga gear and full make-up? This whole ‘full make-up yoga outfit wearing’ thing kills me. Are you going to the gym or out for eggs benny? Does that crazy expensive shiny watch have a timer so you know when to transition from a run to a walk? I don’t get it. Australia has a drinking culture unlike anything I’ve seen in North America. It’s as though people want to find any excuse to drink and drink to excess. I can’t tell you how many times I’ve seen people stumbling out of bars completely drunk off their faces. The route I walked to into work in the morning had me passing by three bars and after a football, rugby or cricket match, there was always remnants of someone’s sick on the sidewalk. Not pleasant and not pleasant to think about as Australia loves sports so there’s always a game on and yes, another reason to drink. Melbourne Cup is a notorious event for people drinking to excess. The horse race, held annually in November, is all about drinking. The main race is held around lunchtime and only lasts for 10 minutes… tops. People get dolled up in their finery, ladies wear fascinators, men wear suits and they look fantastic. The drinking starts at 10:30am and doesn’t stop until 8pm. I’ve seen extremely large men stumbling home, walking out in front of traffic and almost causing accidents because they were too intoxicated to walk. Tragically, there has been a number of alcohol-fuelled deaths. The number of ‘king hits’ (what we call a sucker punch to the head) are on the increase as a result of booze-fuelled violence. So, having gone through the good and the bad of living in Brisbane, I can honestly say it’s been a great experience; one that I’ll cherish and remember for the rest of my life. We’re set to head back this June and I’m sure it will be difficult to leave such a wonderful and beautiful place.